Annually sporting the largest crowds on the PGA TOUR, the FBR Open has gained legendary status on TOUR for being unlike any other golf tournament. Yes, the Phoenix TOUR stop is different from all the rest, but what makes it so? It starts with the unbelievable golf played by the likes of JB Holmes, Aaron Baddeley, Phil Mickelson and Vijay Singh on the beautiful TPC Scottsdale and ends with the biggest galleries on TOUR. In between the golf and the galleries are The Thunderbirds. Hosts of the Open since 1939, this fine group of Valley business men has turned an ordinary "golf tournament" into a community event/happening -- commonly referred to as "The Greatest Show on Grass" -- and along the way have raised close to $53 million for Arizona charities. The 2009 edition will mark the 74th playing of the Open, and the sixth as the FBR Open, making it one of the five oldest events on the PGA TOUR. 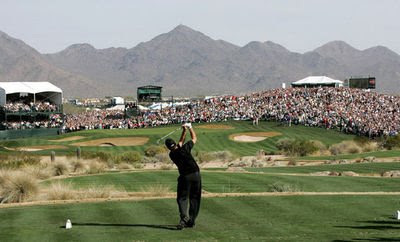 If you are thinking about attending the 2009 FBR Open, there are a few things you should know. First, parking is never a problem. A number of large lots are located in proximity to all the action and patrons have the choice of walking to the event or being shuttled practically to the front door. Second, ticket access is simple. Due to the design of the FBR Open course and grounds, an unlimited number of people can witness great golf action. Thus, tickets are never sold out. 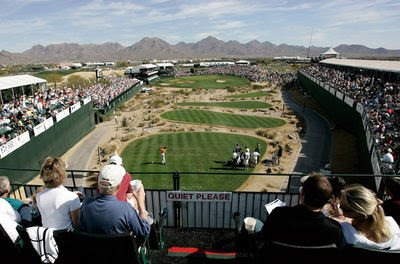 Finally, there’s the TPC Scottsdaleitself, one of the finest venues on the PGA TOUR for players and fans alike. They don’t call it the “Stadium Course” for nothing. There’s room aplenty to watch the key shots on all of the critical holes. Crucial are the final four holes, which offer classic risk/reward options for the game’s top pros. Frequently Asked Questions (FAQs): A useful spectator's guide to help you plan and enjoy your visit to the tournament. Calendar of Events: A day-by-day schedule of FBR Open week activities. Directions and Parking: Everything you need to know about getting to and from the TPC Scottsdale. Red Carpet Photography, is the photographer for Black Top Thunder magazine.com taking photos at the FBR OPEN.